The external pole industrial magnetic filter is a very robustly built filter. Standard units are available for pipe sizes from DN100 to DN250. It is made with flat flanges in accordance with DIN 2576 PN10 and a flat bottom. 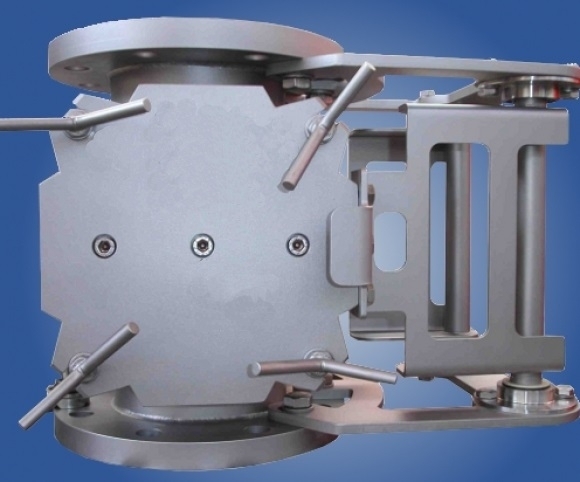 Because the plate magnets are mounted on the outer side of the product chute, this execution has a larger flow capacity than the cleanflows that are executed with magnet bars. Cleaning: Once the product flow has been stopped, the magnet units (doors) must be pivoted away from the product chute. Then the magnets can be wiped clean. Use protective gloves, as the Fe-parts may be sharp and very firmly clamped onto the magnet! Application Powders and liquids under pressure with low Fe contamination. Specially suitable for ‚pulp‘, in eg the paper industry and for larger capacities. Design Flat flangesOutward opening doors with plate magnets (do not need to be lifted). Because the plate magnets are mounted on the outer side of the product chute, this execution is very suitable for eg paper pulp and / or larger flow capacities.